I imagined what it would look like, but I wasn’t even close. 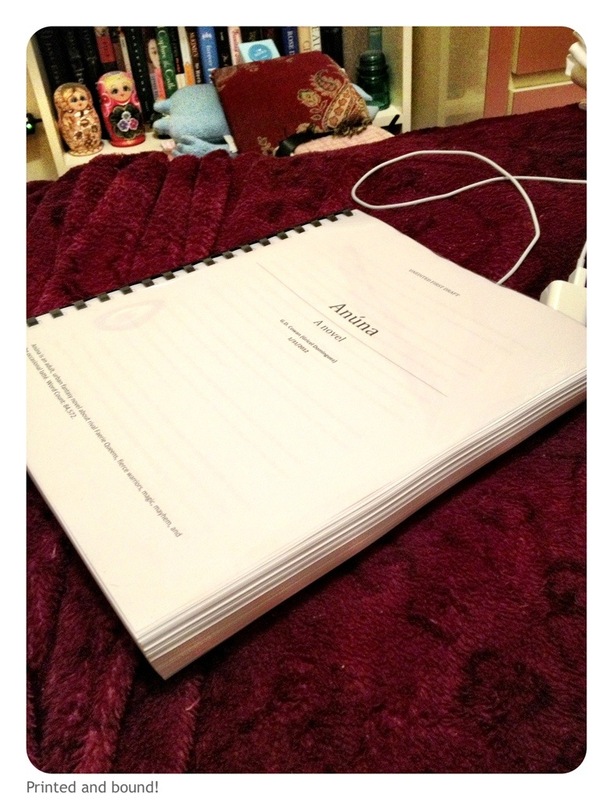 Printed and ready for editing. I’m writing! I am! 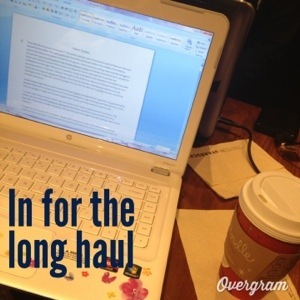 It was a dreadfully bad week for me as far as finding the energy to write. I won’t whine. Much of it was the result of stress and emotional writer’s block, but I did some thinking, and some plotting, and tried to get back on track to finish. I originally told myself I’d finish by December 25th, not because of some silly Christmas miracle wish, but because I hit the 50k mark on November 25th and I figured I could finish the manuscript if I gave myself another 25 days after NaNo. That may or may not happen, but I’m okay with it. It will happen soon enough. I have action scenes coming up and I have discovered that I absolutely love writing action scenes. That should help me get myself going. I originally aimed for an 80k manuscript, and I’m on track for reaching my goal. I’m nearing my climax, so it can only take so many more scenes after that to resolve things. I’m kind of excited and kind of terrified at the same time. I feel good about this story. That’s not something I’m used to when it comes to writing. I won’t be cocky and say it’s great, but I like the characters I’ve created and think it’s much more carefully crafted than my last story. I think my ability to create a writing habit has a lot to do with that sense of rightness, it helps me maintain continuity and that makes quite a difference. Here’s to the next three days. Or however many it takes. Merry Christmas and Happy Holidays to all the other taking part in this writing thing! The flu did me in so that I was barely able to move, let alone get any writing done during the last four days. I had one really great burst of writing the morning before my symptoms started up, and then I had some pretty interesting hallucinations involving writing while I was under the influence of just about every cold remedy in my medicine cabinet, but no actual progress was made after that. A complete first draft by Dec 25 is looking less likely. My energy is still nonexistent and I’m taking a trip to Disney this weekend with the boy (unless something terrible happens… please, don’t), so I’m thinking my progress is going to remain pretty stagnant. But the will remains! Nevertheless, during my semi-OCDish review of my twitter feed while languishing in bed, I saw a challenge posted by the NaNo moderators, urging Wrimos to write a dust cover blurb for their novel. Somehow, I grabbed pen and paper and wrote this down. Two Queens, One Throne. A Tale of Magic and Treachery. Twins born to the King and Queen of Clan Siggel, Anúna and Siobhan were destined to rule the Clan as one. When Siobhan’s desire for power leads her to view Anúna as an enemy and a usurper, it is up to Anúna to fly or fight. Magic, romance, danger, and murder abound as Anúna struggles to restore balance to the Other realm and regain what was hers. Whoever said sisters are supposed to be the best of friends? It doesn’t say much… but I’m still working on how to tell people about it. And that’s one of the major challenges of being a writer, right? Just learning how to talk about what you’re writing. It’s an urban fantasy. It’s mostly set between New York and what I alternately call the Other realm, Faerie, or the Ethereal Lands (the final term will probably be the Other realm. It’s one of the things that I knew I would be changing while I was writing). And it’s about power (and those who seek it *insert mad cackle*), and Anúna finding her way and challenging her sister. It’s also very much what I hope is a modern fantasy with strong female characters. I want no wilting flowers here. And it’s still a ways away from being finished, though I do know where it’s going… I kind of can’t wait to get there. I’ve found that I’m a bit of a sadist when it comes to doing bad things to my characters. What fun! And, yes, they’re Queens, not princesses. I did it! I just ran the draft through the validator and came out with a whopping 53,158 words (that’s about 1,000 shy of my Office word count). I’m so excited and proud of myself for sticking to it. I’m really jazzed about finishing it. I’m building up to my climax now and don’t want to lose my momentum, so I’m going to push myself to stick with my writing schedule before I let any academic side projects take me away from creative writing. I’m loving this! aaaaah! I’m a bit too hyped up right now. Gotta go! Need to save and back up! Yes! I’m at the half-way point and loving it! My goal for the week is to reach a cool 30,000 by Friday. 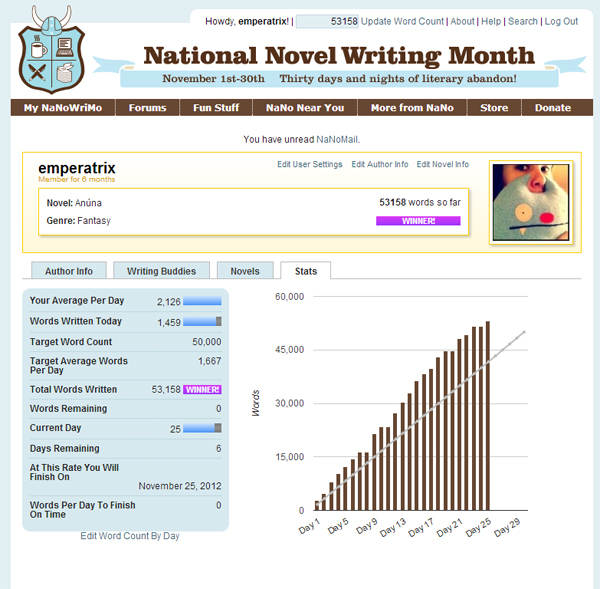 I’m averaging around 2,000 words per day. Had to make up for a bad day yesterday, but I’m back on track for today and meeting my personal goals.